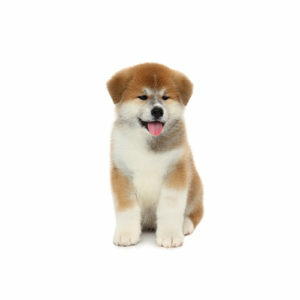 Large, powerful and alert, Akitas are working breed that originated in Japan. Dignified and courageous, the Akita today is popular in the show ring and also participates in performance and therapy work. The breed’s thick double coat can be any color including white, brindle or pinto. An Akita trademark is the plush tail that curls over his back. Although known to be a quiet dog (they are known as the “Silent Hunter” in Japan), the Akita has strong guarding instincts and will sound the alarm if an intruder breaks into their house. Their temperament can range from calm to bouncy and aggressive, so the breed should always be supervised around small children and other animals. They like to be “pack leader,” so obedience training is also necessary for a harmonious household. The breed will groom itself like a cat, but daily brushing is still necessary, as is some daily exercise. An apartment is ok if walked regularly. Thrives in a large yard. Brush frequently with a firm brush.